This past weekend, Dance Mission Theater was home to the WERK Collective’s WERK! Performance Festival. A group of emerging San Francisco/Bay Area dance artists, the 2013 edition brought three days of cutting-edge modern dance by four different choreographers (Tim Rubel, Samantha Giron, Ashley Trottier and Alyce Finwall) to San Francisco’s Mission District. 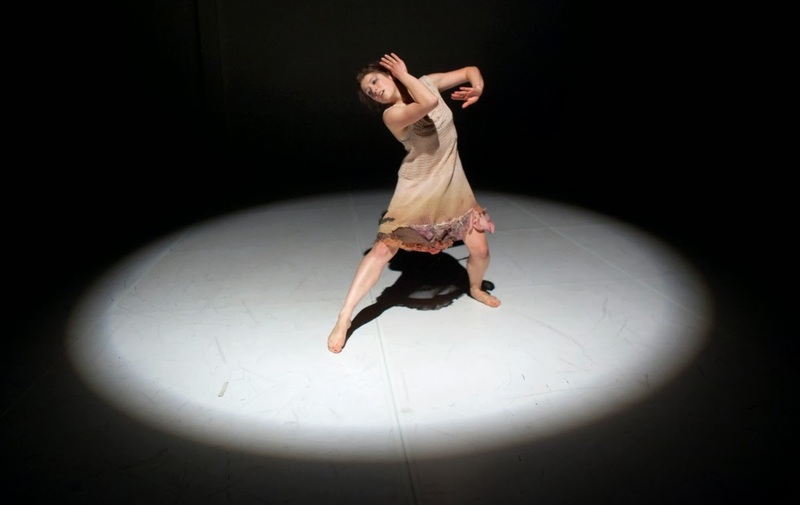 The final program on Sunday evening paired two exciting one-act contemporary works: Samantha Giron Dance Project in “The Dirt on Dorian Gray” and Alyce Finwall Dance Theater’s “Shapeless Crown”. Though diverse in many ways, both offerings had an underlying commonality: a conceptual, deconstructed narrative. Pictured: Clare Schweitzer in "The Dirt on Dorian Gray"
numerous instances of sustained and suspended positions. Sometimes it was two arms reaching out in the space; sometimes it was a tendu on the floor with the other leg was in plié. These were not moments of stillness, posing or waiting, but active expressions of anticipatory kinetic energy. Giron has created a delicious tension between the slow, pulled motions and the faster accented sequences. Neither was meant to be ‘the better’ or ‘the optimal’, instead the juxtaposition simply exposing the presence of both in the human form. In addition, “The Dirt on Dorian Gray” reflected a structural cohesiveness with some well-placed choreographic tools – repetition and accumulation were married with a hearty dose of accelerando and rallantando. Alyce Finwall’s “Shapeless Crown” explored the personal and professional existence of ‘the dancer’ – the expected and unexpected; the conventional and out of bounds; the real and the illusion. Her company of four (Julia Hollas, Vivian Aragon, Jackie Goneconti and Troy Macklin) completed a choreographic marathon of genre, style, humor and intensity. From a farcical bowing scene to supported classical pirouettes to contact improvisation pas de deuxs to showgirl kick-lines to musical theater jazz to dance theater absurdity, they covered a plethora of ground in one single work. A gorgeous contemporary sequence acted as a ritornello between many of the different variations, bringing the cast back together as a whole entity and back to the foundation of modern technique. And a delightful surprise came at the end of “Shapeless Crown” as this repeated interlude phrase was danced in reverse. Both “The Dirt on Dorian Gray” and “Shapeless Crown” had inventive choreography, beautiful dancing and a solid conceptual basis. But each piece did seem a little long and perhaps in need of a tiny bit of editing. The ideas and images were very clear, and still would have been clear even with less material.